From time-to-time, I still crave for a plate of mouth-watering Pancit Malabon. Although there are different pansit offerings in the country (depending on how it is prepared and from region it comes from), I am partial to Pancit Malabon due to its thick rice noodles, yellow-orange sauce and seafood toppings. I find it similar to palabok in the way it is prepared. Both share the same toppings of shrimps, hard boiled eggs or pork cracklings, smoked fish flakes and chopped spring onions and kalamansi on the side. The distinction lies in an extra topping of seafoods like oysters and adobong posit (which abound in Malabon), and chopped vegetables. My earliest memory of Pancit Malabon was my lola’s cooking. Every time we visit her at Gasak, she would serve us Pancit Malabon in the afternoon paired with sapin-sapin sa bilao. I would always look forward to weekends so I can savor the rich goodness of pancit malabon. As its name implies, this Tagalog dish originated in Malabon City, northern part of Metro Manila. It would take you quite sometime to travel there and taste this delicious food, but it is worth the trip. Nowadays, you need not travel that far to splurge. Pancit Malabon is available almost every business corner in the metropolis. Some even offer it through express delivery in the comforts of your home. 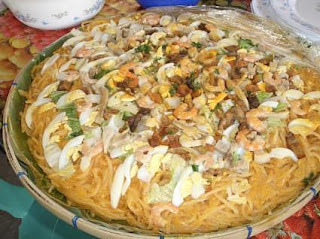 Many sellers in Manila claim to offer original Pancit Malabon but only very few manage to imitate the unique taste of this pancit variant. I am talking about Pansit Malabon Express, Inc. as one of the few fastfood chains which offers authentic the pancit malabon.